The History of See Song & Sons Sdn. Bhd. The Company first started as a modest contracting service under the name See Song in 1961. During then, it was registered under the Drainage and Irrigation Department (formerly known as Jabatan Parit dan Tali Air (JPT) which was later changed in 1989 to Jabatan Pengairan dan Saliran (JPS) with a Class B License classification. 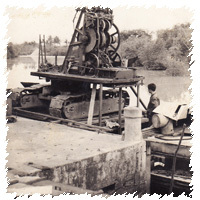 The Company was primarily involved in JPT works including construction of pump houses, tidal regulating gate systems, soil/concrete drains, wooden/ concrete foundation piles, wooden/ concrete building structures, road culverts and others. In the year 1979, See Song experienced a transformation to See Song & Sons, driven by its development in contracting service provision in the industry. The Company was later incorporated as a private limited company in 1981 as it undergoes continual expansion hence its current title See Song & Sons Sdn Bhd.